Sensex Technical View and Technical Charts of Jain Irrigation, Deepak Fertilizers and TVS Motors. A nice triangle pattern waiting for a breakout above 180 levels. Can jump to 200 + in short term. 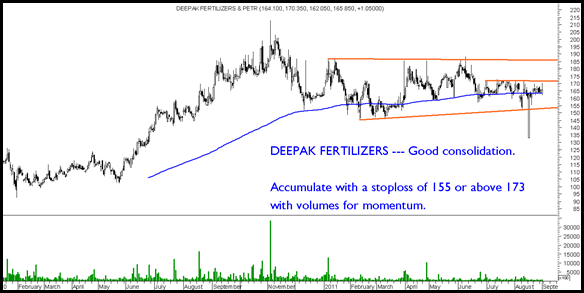 Yet another fertilizer stock which is shaping up nicely for short to medium term. The others we are recommending is GSFC and Chambal. 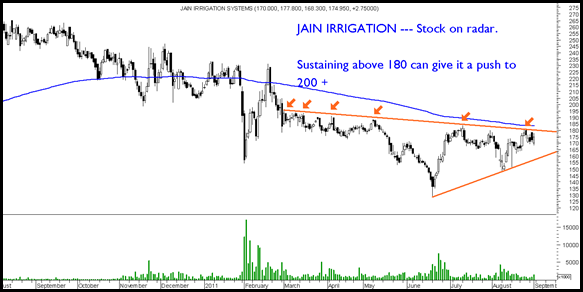 Investors can look to accumulate the stock with medium term view and target of 185-200++. 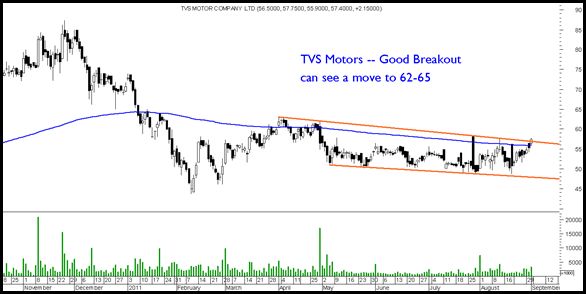 TVS Motors – The stock has finally broken out of a sideways range and may now piggyback on the move in Hero Honda and Bajaj Auto. The view remains simpler as mentioned in our previous presentation to book partially on rise at 16800/17300 levels. On dips we may watch for the 16000-16400 support zone to hold. WILL AGAIN BE ON CNBC TV 18 BULLSEYE PROGRAM for the Week September 5th to 9th September- Timing for the show 11 a.m.
hi nooresh bhai hope u r fine following ur program on cnbc congrats for that. sorry there is no option for uploading so i have sent u a mail.